Note: This experiment is now obsolete. 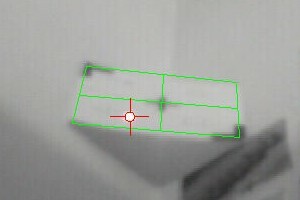 See Gesture based control using a Laser pointer and Image Recognition. 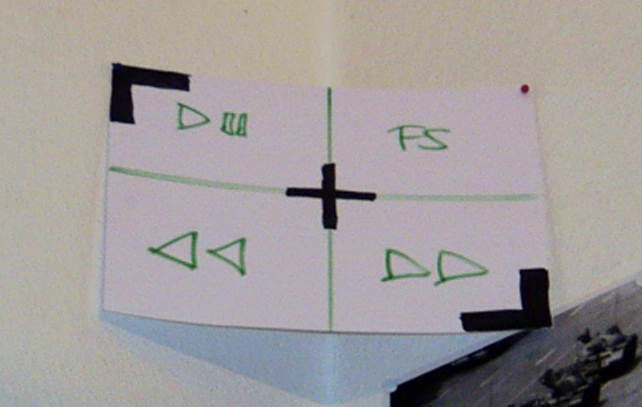 I wanted to be able to control the videoplayback of the mediacenter (hooked to my tube projector) without any extra remote control. The remote control of the tube projector has a built-in laser pointer. I used a ultra-cheap 4 euro CMOS-camera and some self-programmed quick'n'dirty image recognition for the task. You don't have to aim before you "click". Just turn on the pointer pointing somewhere random, and guide it to the box you want to select. Boom.